MASKerade: OLW141 - Thank you! This is for this week's One Layer Wednesday hosted by Karen. It's called Repeat After Me (such a cute name!) The idea is to use one stamp repeatedly to create a background. 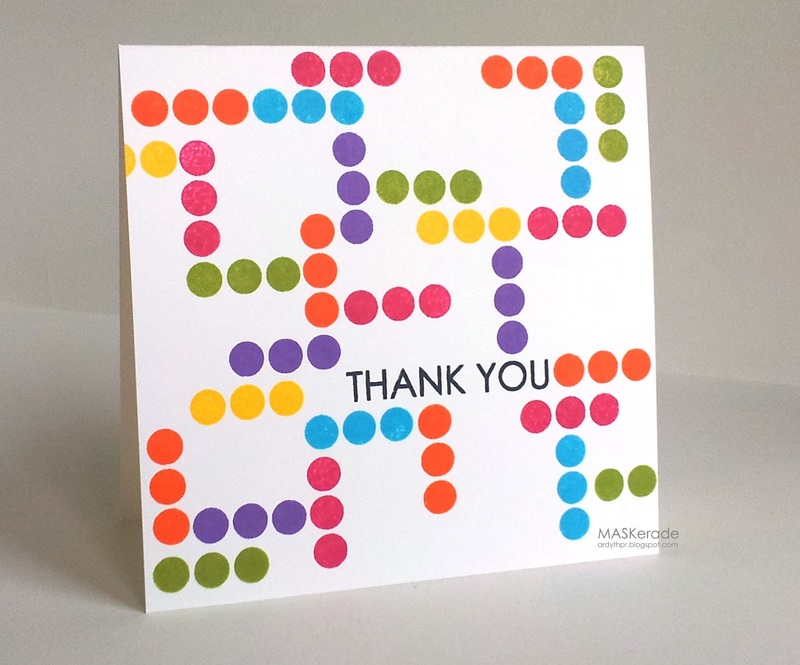 I have this little stamp of 3 dots and I thought it was fun to use it in this way to make another thank you card. I started by stamping the sentiment and then branched out from there. So fun! Love this theme and use of stamps! FABULOUS one layer card! Awesome! It makes me think of a PAC Man game! So fun. I thought exactly the same thing as Lynn! Reminds me of Pacman. No idea why. It just does. This card is really clever, love the bright colours and what a great idea. Love the colors and the graphic way you laid out the dots. This is so fun!!! Love all those amazing dots. Such a fun design, Ardyth! Love all those wonderful colors, too! I love your card and wish I had the patience to stamp like you do. They always look perfect. Fabulous! Gorgeous colors! Awesome job 'just running' with the dots! Change up the sentiment to h-birthday and this would have been another slam dunk winner in the Gallery Idol contest! WOW! I REALLY like this card! When I first looked at it I thought how did she ever do thi? But you explained the 3 dot stamp, and it makes sense. Fabulous!